Differential Protection is based on the fact that any fault within electrical equipment will result into the difference in current entering it and the current leaving it. Thus by comparing the two currents either in magnitude or in phase or both we can determine a fault and issue a trip decision if the difference exceeds a predetermined set value. The difference in current is called the differential current. 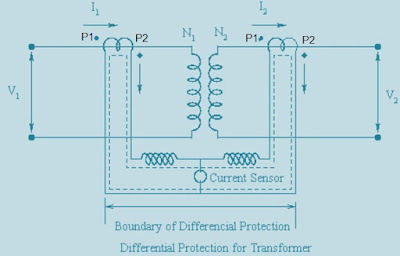 In this post we will discuss about the Differential Protection of a Transformer. 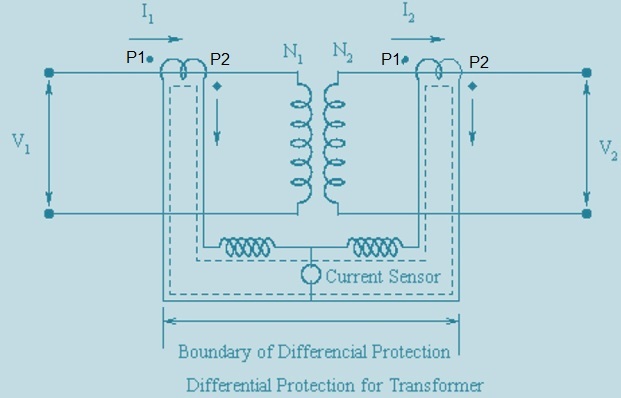 Consider an ideal transformer with the CT connections, as shown in figure below. Current rating of secondary winding = 1000A. Then if we use 100/5 and 1000/5 CT on the primary and secondary winding respectively, then under normal operating conditions the both CT currents will be 5 A in magnitudes. By connections the primary and secondary CTs with due care to the dots (In actual CT polarity marking is by Terminal P1 and P2. Current is supposed to flow from P1 to P2), a circulating current can be set up as shown by dotted line. Now if an internal fault occurs within the Transformer like interturn short etc., then the normal mmf balance is upset i.e. under this condition, the CT secondary currents of primary and secondary side CTs will not match. The resulting differential current will flow through overcurrent relay. If the pickup setting of overcurrent relay is close to zero, it will immediately pick up and initiate the trip decision. In practice, the transformer is not ideal. A differential current always flows through the overcurrent relay. Therefore overcurrent relay pick up is adjusted above the no load current value. In Differential Protection of Transformer CT matching is an important thing to care care else differential protection won’t be efficient and reliable. Let the transformer turns ratio is N1/N2 and the current in primary & secondary of transformer are I1 and I2 respectively. Suppose CT-1 having ratio of 1/n1 is installed in primary whereas CT-2 having ratio of 1/n2 is installed in secondary. In case, Transformer Tap is used then nominal Tap position should also be taken into account. I am testing Engineer, working @ABB-KSA. This web site is very useful and the the topics are essentially important, great deal of thanks for such amazing information. Thank you very much! Please share if you like it. Let the transformer turns ratio given N1/N2 and the corresponding CT ratio be given by 1/n1 and as 1/n2. Please check now. If you still have doubt, please comment.